Happy New Year everyone, may your 2018 be happy and healthy. We’ve been down south to visit my Mum, and only got back to Salford for Hogmanay, so I decided to pick plants from both gardens. I cut some Cornus (dogwood) from my mother’s garden which has bright red stems and variated leaves, and when I got home, I cut some Hypericum from my front garden. My garden is very wet and blown about, but there are crocus and narcissi poking though the soil, and the hellebore are flowering so they will probably get their chance next week in a vase. 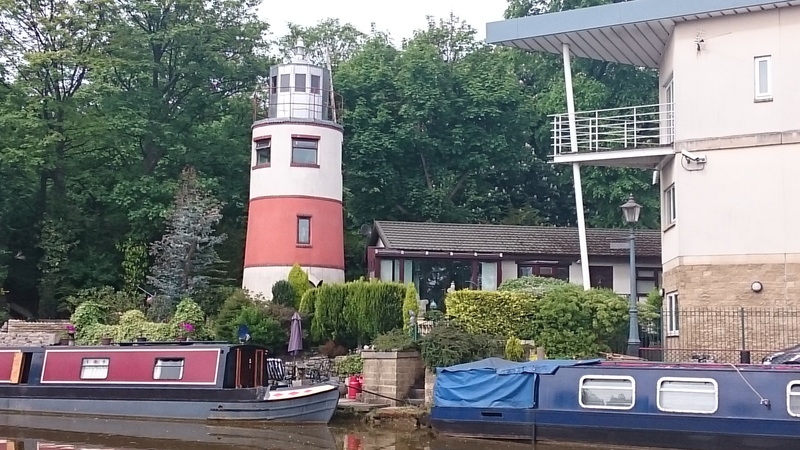 Please have a look at Cathy’s vase this week, over at Rambling in the Garden who hosts IAVOM, as well as contributions from gardeners around the world. 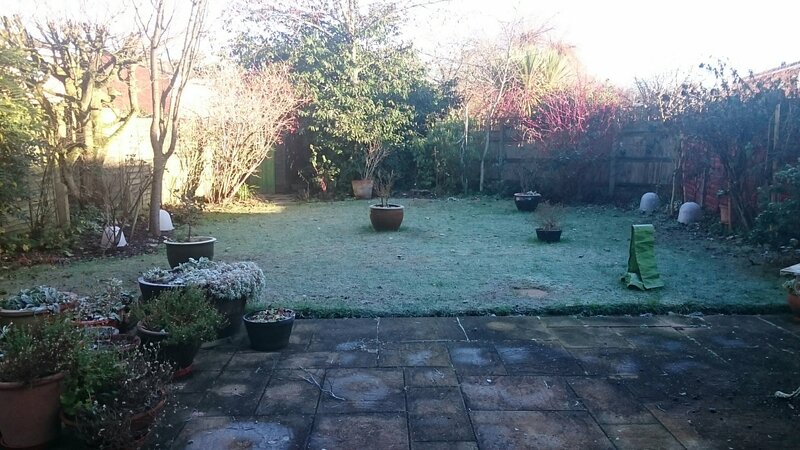 I’ve written a few times about my mother‘s garden, she’s lived in the house since it was built in the 1970s – there’s many happy memories of food, paying games and relaxing in the garden with the family. My mum is the gardener in the family, my Dad mostly dug holes for plants, mowed the lawn and grew herbs. I get my love of gardening from my Mum. The soil is clay so that’s why much grows in pots and a North facing garden just like ours in Salford. There’s usually a great many fuchsias in pots on the terrace – as usual they’re living in the garage over the winter (there’s a window). My Mum has a gardener to do the heavy work, and pruning now, as she’s been retired along time. My Chap and I do get roped in when we are visiting though. 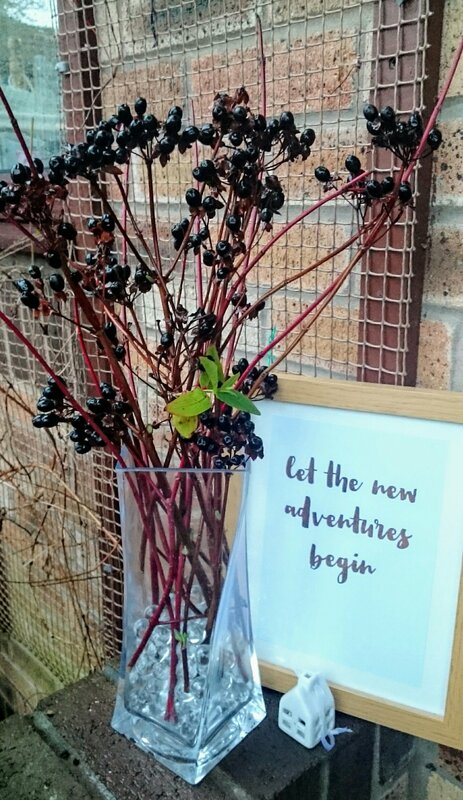 This entry was posted in History, In a vase on Monday, Manchester and tagged #onehouroutside, #walking, Bridgewater canal, Cornus, hypericum, monton, RHSBridgewater on January 3, 2018 by Bec - views from my garden bench. I don’t make resolutions in the conventional sense of ‘New Year, New Me’ as I think the pressure of expectation often makes people fail. I just believe if you want to change something whether it’s big or small, just do it. Pick a day, start and try your best… it doesn’t have to be on 1st January either. 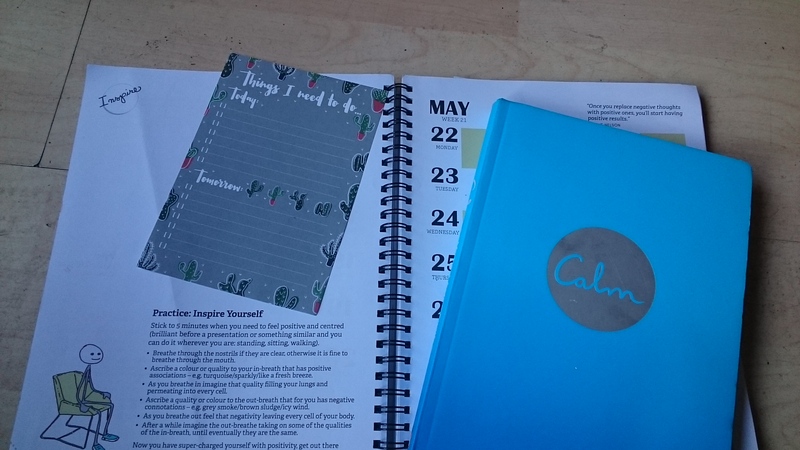 It’s also important to remember that small changes count just as much big ones; everyone has to start somewhere… and this year in 2016, it’s about carrying on, finding more happiness and new adventures. 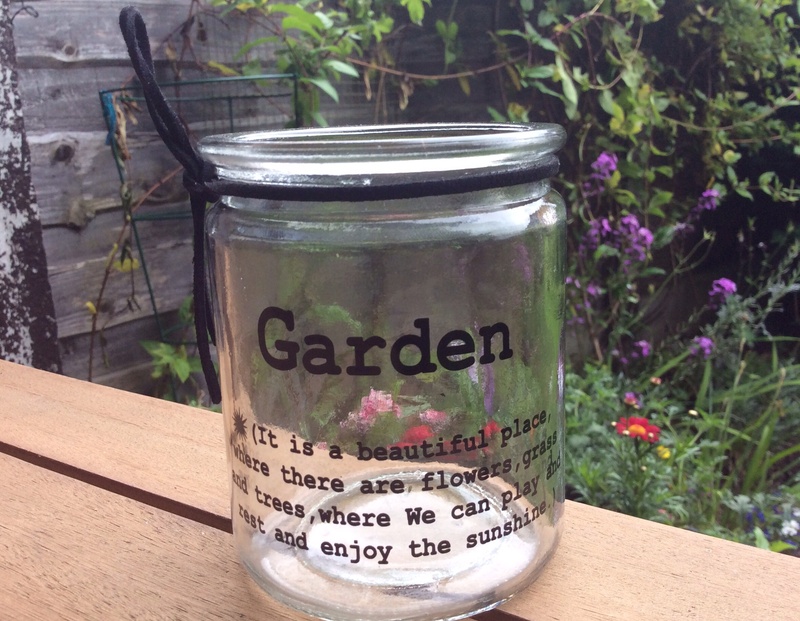 This entry was posted in 100 happy days project, Life and tagged #100happydays, memory jar, mental health, mindfulness, monton, parkrun monton salford, tai chi on January 4, 2016 by Bec - views from my garden bench. 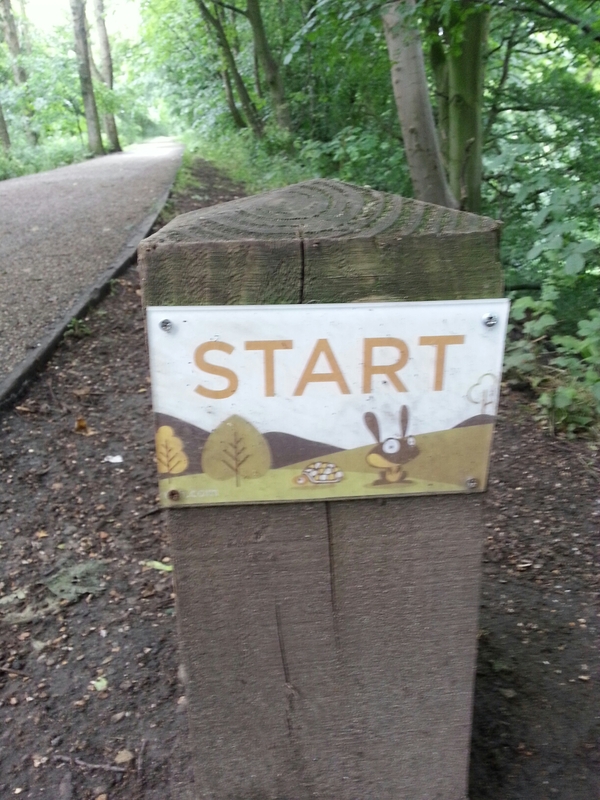 This entry was posted in Manchester and tagged exercise, monton, parkrun, running on July 8, 2015 by Bec - views from my garden bench. 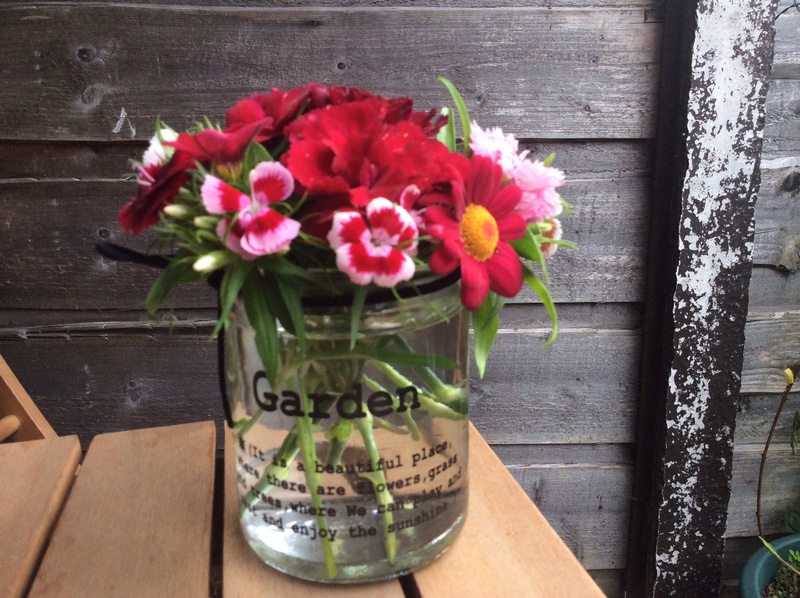 This entry was posted in Manchester and tagged Incredible edible Salford, monton, Social enterprise on July 1, 2015 by Bec - views from my garden bench. dianthus ‘Oscar Dark Red’ it has tiny specks of yellow. It’s new in the garden this year so we will have to see how it gets on. dianthus with dark pink ring at the front are ‘Red picotee’ – there were others in the pack with different colour combinations but the other flowers were eaten by bugs. other kinds of dianthus have been in the garden a few years but I don’t know what kind they are. a red Argyranthemum – it’s not been in the garden long so I’m not quite sure how big it will grow – A friend gave me this so I don’t know what is called either. The quote on the jar really resonates with me. My garden is my sanctuary and I’ve really missed it. I missed my Chap more though – especially as it was our 5th anniversary while I was away. 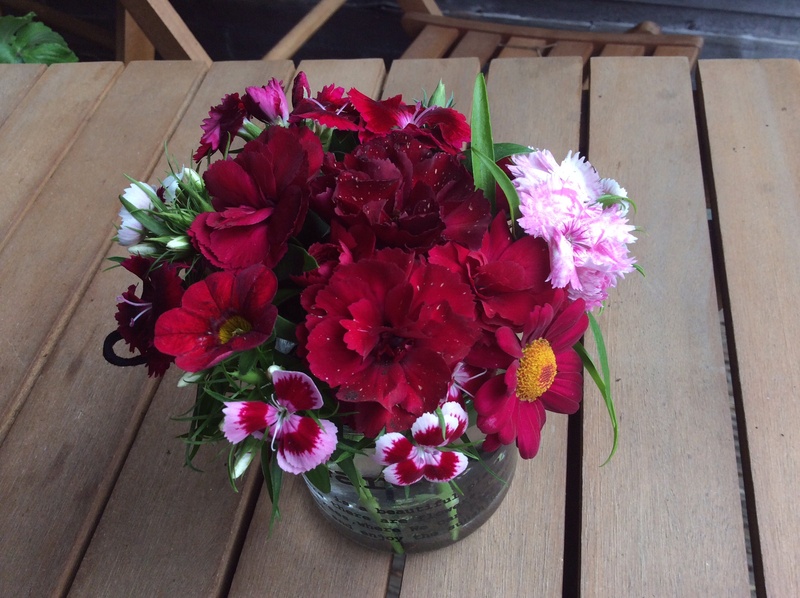 I enjoyed picking these flowers very much, as I’d been away from my garden for over a week – so much has grown and flowered. I was straight outside when I got home to see what had changed and I’m writing this post on the laptop at the bistro table at the bottom of the garden. As usual, I’m late with my contribution – oops. Today, I got back from a military history tour with my mum which was booked last year. We’ve been to Belgium for the 200th anniversary of the Battle of Waterloo – 18 June 1815. We saw a huge re-enactment and travelled around battle sites following events which enabled Wellington and the allies to defeat Napoleon and the French. She has been so excited about this as she loves this period of history (and the Duke of Wellington!). It was a really busy week, early starts and a lot of tramping around fields, so I’m very, very tired. It was good to spend time with my mum, but the grim details of the Battle of Waterloo were difficult after all that’s happened this year. I’ll write more about this break shortly; it was an interesting week but military history isn’t really my thing, as I much prefer economic and social history and the lives of ordinary people. I saw quite a few lovely gardens and flower displays all across Belgium so I’ll do a post about that too. The people on the tour thought I was a bit odd taking photos of flowers and gardens while they were busy taking photos of war memorials – ho hum. There’s was clever wall display commemorating the battle in Wellington’s headquarters using moss, and the garden was lovely too. The mini vase (or jar more like) is from one of the local florists on my local high streets – it’s a jam jar style and about 4 inches high. Garden – It is a beautiful place where there are flowers, grass and trees, where We can play and rest and enjoy the sunshine – 23 June 2015. My local high street, Monton in Salford, is a thriving place with lots of lovely shops including an art and craft shop, handbag shop, cake and decoration shop, boutiques, florist, a proper fishmongers as well as the usual convenience stores and estate agents. It’s got a Holt’s pub called ‘The Park’, a couple of wine bars, a craft beer bar called ‘Malt Dog’ as well as a couple of restaurants, and the newest La Turka (Turkish). There is an active community association too www.montonvillage.org.uk/ who do alot of work with businesses promoting the area and amenities, arranging gardening groups on Monton Green and Christmas lights too. The floral displays were placed in ‘Best urban village’ in ‘Britain in Bloom’ a few years ago. 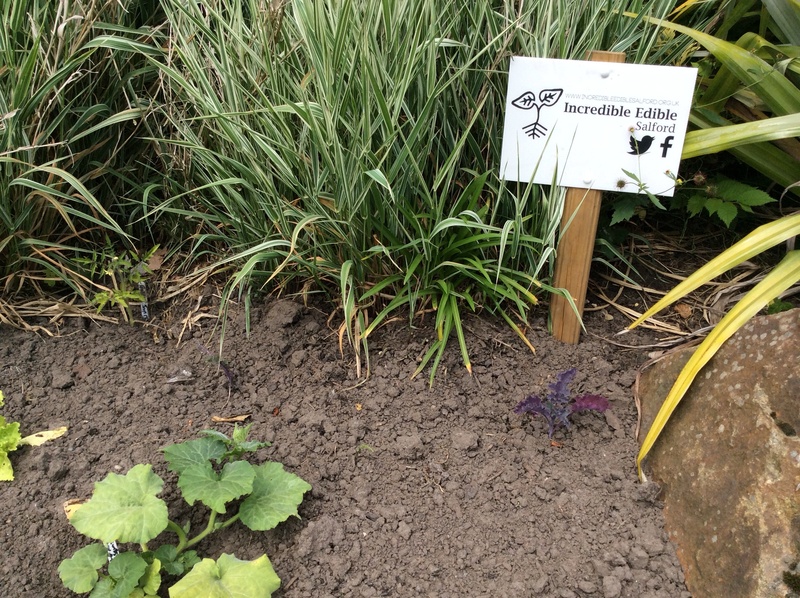 There’s also vegetable plots which are part of ‘Incredible Edible Salford’ www.incredibleediblesalford.org.uk/ (they’re on facebook and twitter too). You can find out more about this lovely meme hosted by Cathy over at ‘Rambling in the Garden’ – this week she has a beautiful yellow rose as the centre piece of her arrangement and the cutest little tea set – do have a look. I really love seeing what everyone is picking from around the world and it gives me loads of ideas for my garden and vases. Have a lovely week everyone – and let me know if you’ve been out and about? It’s going to be sunny in Manchester this week. 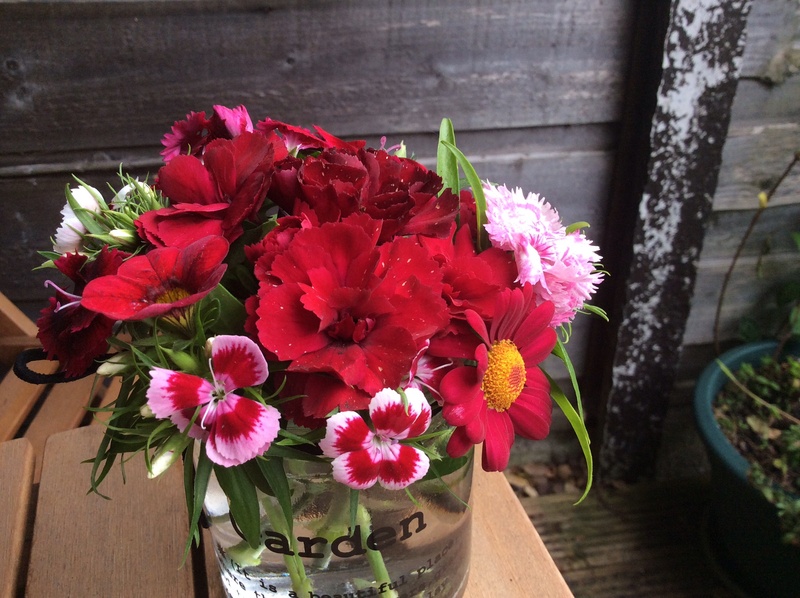 This entry was posted in Adventures, Gardening, History, In a vase on Monday and tagged Argyranthemum, Belgium, dianthus, In a vase on Monday, marguerite, monton, petunia, salford, Wellington on June 23, 2015 by Bec - views from my garden bench.